Baby is the size of: an Endive! Baby's digestive system is preparing for the outside world, and he's begun manufacturing meconium. Symptoms: Just the aches that come along with a growing belly. Movement: Oh, yes! He moves so much and is already so strong. It's so different than my pregnancy with Charlie Beth. Little Miss was a very chill baby in the womb (saving all that energy until she was born, I suppose). 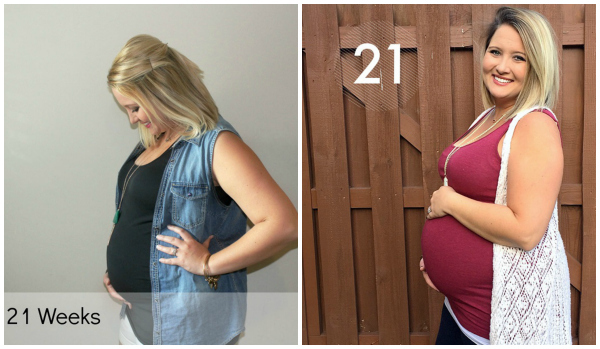 I actually had to have weekly NSTs during my third trimester because of her lack of movement. This little boy though, he is all over the place! Steven felt him kick for the first time over the weekend (something that didn't happen until I was 27 weeks along with Charlie Beth). Cravings/Aversions: I really wanted Firehouse last week, but that's about it. Sleep: Some nights are better than others. The past couple of nights I've had to prop myself up on pillows so I could sleep on my back in a semi-sitting position. It was the only way I could get comfortable. I've also been staying up much later than usual. I feel exhausted during the day, but once the sun goes down I'm wide awake, which is not like me at all! Mood: The emotions are high and the mood swings are strong. Maternity Clothes: Leggings and maternity tops are basically all I'm wearing and probably all I'll continue to wear for the rest of this pregnancy. Nursery: I picked out paint swatches over the weekend, so that counts as some sort of progress. Right?! Best moment this week: Spending some one on one time with my husband in Tuscaloosa on Saturday tailgating and watching the Tennessee v Bama game. Looking forward to: Celebrating Halloween and my baby girl turning TWO years old in the coming weeks. I can't believe she's almost two! Seriously, where does the time go?! I've been struggling to fall asleep at night too. Mainly cause I'm the most comfortable on my back. I can't wait to see his nursery come together. I had to get weekly NST's in my third trimester with Rory too and had to drink ice cold apple juice at the beginning of every single test. I can't wait to start feeling kicks with this little one but I didn't feel them with Rory until I was 22 weeks and 5 days. Do you have a nursery inspiration board put together or theme in mind?